Wendy Williams, Kirstin Smith, Linda Davis, Debbie Stevens (Great Outdoors life group leader), George, Conner, Gavin, Trenton with his aide Jodi, and Lisa Madden. 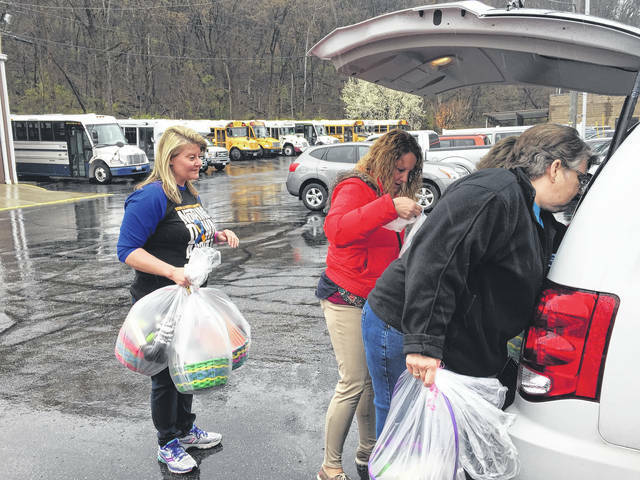 The Great Outdoors Life group unloads Easter baskets with the help of Missy Cassidy, secretary at Vern Riffe School. Shortly after noon Wednesday, the Vern Riffe School received a very generous and festive donation. 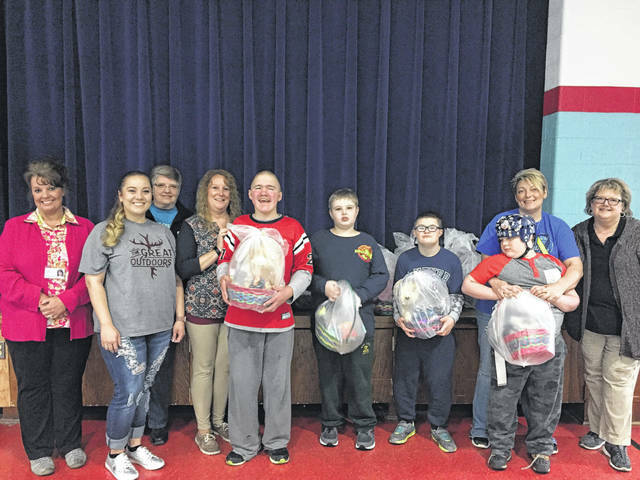 The Great Outdoors group from Life Point Church donated about 60 Easter baskets, stuffed with all sorts of Easter goodies, and loaded them into the school’s gymnasium. Inside the baskets were items like books, candy, chocolate, small toys and stuffed animals, all collected by the church group. The stuffed toys were donated by Wendy Williams of Leading Respiratory. The Easter baskets were decorated with either blue, pink or yellow ribbon to indicate if the basket was for a boy, girl or either. A few of the students at the school were present when the Great Outdoors group brought in the donations, and they were thanked by big smiles and hugs. According to staff members, each student at Vern Riffe School, ranging from ages 5 to 22, will receive one of the baskets. “The kids are going to love it. They are so excited. We love when outside people come in and see us, because we want them to see what we do and what we’re all about. Plus, it tells the children that people outside of the school really care about them, too,” said Cindy Coriell, physical development intervention specialist at Vern Riffe School. https://www.portsmouth-dailytimes.com/wp-content/uploads/sites/28/2018/03/web1_VERN2018328134440839.jpgWendy Williams, Kirstin Smith, Linda Davis, Debbie Stevens (Great Outdoors life group leader), George, Conner, Gavin, Trenton with his aide Jodi, and Lisa Madden. https://www.portsmouth-dailytimes.com/wp-content/uploads/sites/28/2018/03/web1_VERN12018328134447976.jpgThe Great Outdoors Life group unloads Easter baskets with the help of Missy Cassidy, secretary at Vern Riffe School.